Today was Day #3 of Chocolate and Berry Theme Week. Inside a small plastic "berry medley" tube offered at a local Starbucks (Seattle, WA) were shiny berry colored orbs. At the core of these "Chocolate Bites" were sweetened blueberry and raspberry fruit pieces, coated with layers of dark and white chocolate, and covered with a confectioners coating. 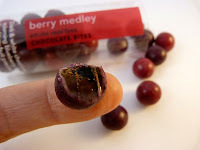 The berry taste of these half-candy, half chocolate pieces was natural and authentic, and they hit the spot. Although they were a bit on the sweet side.